Menorahs are a personal item. We remember getting our first one more than 20 years ago. But sometimes the best menorah is the one you make yourself. If you happen to be away from home during the festival of lights or you’re just looking for a Hanukkah project, these five intriguing DIYs have you covered. If you were lucky enough to get candy instead of socks on Hanukkah when you were growing up, you may already have the proper supplies for this one. The best part of this one is the prep work. 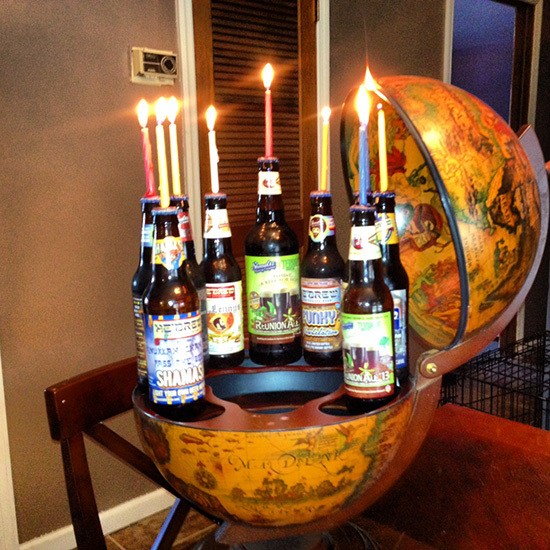 Note: You might want to “empty” your bottles and assemble your menorah on different days. The Shmaltz Brewing Company actually has complete instructions and a kit if you want your beer menorah to be totally professional. An easy project that will let you celebrate Hanukkah even when stuck with the most minimal of supplies. All you need is a foil pan, something sharp and some birthday candles. A quick trip to Home Depot and half an hour of screwing pipe fittings together, and you’ve got yourself a handsome piece. Remember when you used to build macaroni sculptures and give them to your mom like they were real presents? Now you can treat her again. This one comes in both the edible and not edible variety depending on whether you want to use candles or pretzels.